Wireless access control is now widely been deployed with wired access controls in many commercial facilities and institutions. The main function of wireless access control is to provide authentication and authorization for the valid users. Wireless access controls uses radio frequency technology to communicate in real time and allows the end users to access to their facilities. It offers flexibility over traditional hardwired access control systems, as it is easy to install and cost lesser than traditional wired access control. In light of these advantages, the global wireless access control market was valued at US$830.37 mn in 2016 and is expected to grow at a CAGR of 7.9% from 2017 to 2025. Transparency Market Research states that the global wireless access control market will be worth US$1,657.0 mn by the end of 2025. Global wireless access control market is segmented into component, application, end-use industry, and by region. By component, the market is further segmented into hardware, software and services. Hardware segment is further bifurcated into readers, locks, transceivers, batteries and others. Again, the readers sub segment is further divided into biometric, RFID tags and readers, mobile credentials and others. A thorough analysis of the market suggested that the RFID tags and readers is popular amongst enterprises that have a capacity of over 200, whereas biometrics remained integral to smaller setups. However, the overwhelming usage of smartphones is likely to have a positive impact on smartphone access sub-segment. By application, wireless access control market can segmented into door access controls and non-door access controls. Door access controls contributing highest market share, the main functions of door access control is used to provide access to authorized users, monitoring timing and attendance. Also, the non-door access controls that includes cabinet locks, server rooms and others are becoming the hottest trends. Analysts anticipate that the non-door access control segment is likely to surge at a CAGR of 12.9% during the forecast period. By end-use industry, the wireless access control market can be segmented into residential, commercial and institutional. Commercial industry enjoys the highest market share among others due to necessity of safeguarding the organization assets and employee’s safety. The commercial segment is expected to the lead the global market as the need to secure workplace premises is an urgent one amongst enterprises of varying capacities. By the end of 2025, the commercial segment is projected to acquire a share of 56.31% in the global wireless access control market in terms of revenue. Global wireless access control market is segmented by region into North America, which includes the U.S, Canada, and Rest of North America, South America, which is inclusive of Brazil and Rest of South America, Europe, which includes the U.K., France, Germany, and Rest of Europe, Asia Pacific, which includes China, India, Japan, and Rest of Asia Pacific), and the Middle East & Africa, which includes GCC, South Africa, Rest of Middle East & Africa). North America has the highest market share for wireless access controls with the highest market revenue in 2016, accounting to about 31.3% in terms of revenue. This trend in the regional market will be fueled by the increasing usage of smartphones. Asia Pacific region is anticipated to grow at highest CAGR of 9.3% by revenue due to rise in service industry in the emerging economies of this region. The prominent players in the wireless access control market includes ASSA ABLOY Group, Dormakaba Holding AG, Johnson Controls Plc., Salto Systems K.S., Bosch Security System, Honeywell Security Group, Cansec System, Tyco Security Products, Godrej & Boyce Manufacturing Company, Altman Integrated Technologies and Nortek Security and Control LLC among others had an prominent market share. For global wireless access control market, ASSA ABLOY Group and Dormakaba Holding AG held the largest market share in 2016. Global Wireless Access Control market report provides analysis for the period 2015 – 2025, wherein the period from 2017 to 2025 is the forecast and 2016 is the base year. The data for 2015 has been included as historical information. The wireless access control report covers all the major types and application playing significant role in the global wireless access control market’s growth over the forecast period. The report also include various drivers, restraints, and opportunities expected which affect market’s growth during the above mention period. The study provides an entire perspective on the market’s growth in terms of revenue in US$ Mn and volume in thousand units, across different geographical regions such as Asia Pacific, North America, Middle East & Africa, Europe, and South America. The market overview section of the report demonstrates the market dynamics such as the drivers, restraints, and opportunities that influence the current nature and future status of this market, key indicators and trends. An attractiveness analysis has also been provided for every segment in the report, in order to provide a detailed understanding of the overall scenario in the wireless access control market. Moreover, the report provides an overview of various marketing strategies adopted by the key players present in the market. Key market indicators also been included in the report provide significance of the factors which are capable of changing the market scenario. These indicators are expected to define the market position during the forecast period. Global wireless access control market is bifurcated by components, by application, by end-use industry and by region. By components, the market is further segmented into Hardware, software and services Hardware segment is further bifurcated into Readers, locks, transceiver, batteries and others. Readers is further sub-segmented into biometrics ,RFID tags & readers, mobile credentials and others By application, wireless access control can segmented into door access control and non-door access control. By end-use industry, wireless access control market is bifurcated as residential, commercial and institutional. The report also highlights the competitive landscape of the global wireless access control market, thereby positioning all the major players according to their presence in different regions of the world and recent key developments initiated by them in the market. The comprehensive global wireless access control market estimates are the result of our in-depth secondary research, primary interviews, and in-house expert panel reviews. These market estimates have been analyzed by taking into account the impact of different political, social, economic, technological, and legal factors along with the current market dynamics that affect global wireless access control market growth. 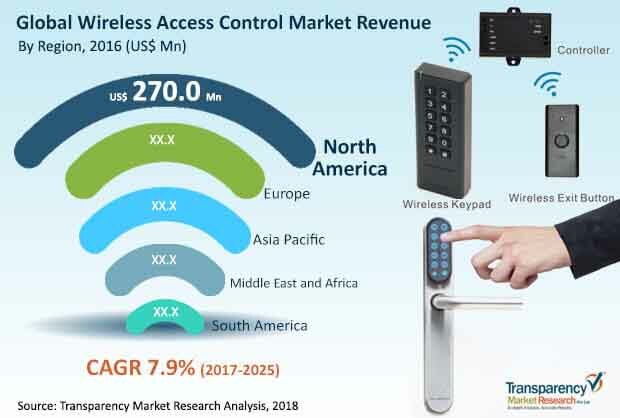 This report provides all the essential information required to understand the key developments in the wireless access control market, growth trend of each segment and companies strategies to efficiently compete into the market. Also, the report provides insights related to trends and its impact on the market. The report also includes competition landscape which includes competition matrix and market share analysis of major players in the global large format display market based on their 2016 revenues and profiles of major players. Competition matrix benchmarks leading players on the basis of their capabilities and potential to grow. Factors including market position, offerings and R&D focus are attributed to company’s capabilities. Factors including top line growth, market share, segment growth, infrastructure facilities and future outlook are attributed to company’s potential to grow. The prominent players in the wireless access control market includes ASSA ABLOY Group, Dormakaba Holding AG, Johnson Controls Plc., Salto Systems K.S, Bosch Security System, Honeywell Security Group ,Cansec System, Tyco Security Products, Godrej & Boyce Manufacturing Company, Altman Integrated Technologies and Nortek Security and Control LLC, among others.